When you look at a rich person drive a flashy car or take that special holiday in summer, try to understand where they have come from. Richness requires great planning, focus and care on how you manage your finances. You must be careful on the investments you get into and remain highly vigilant on your businesses progress. 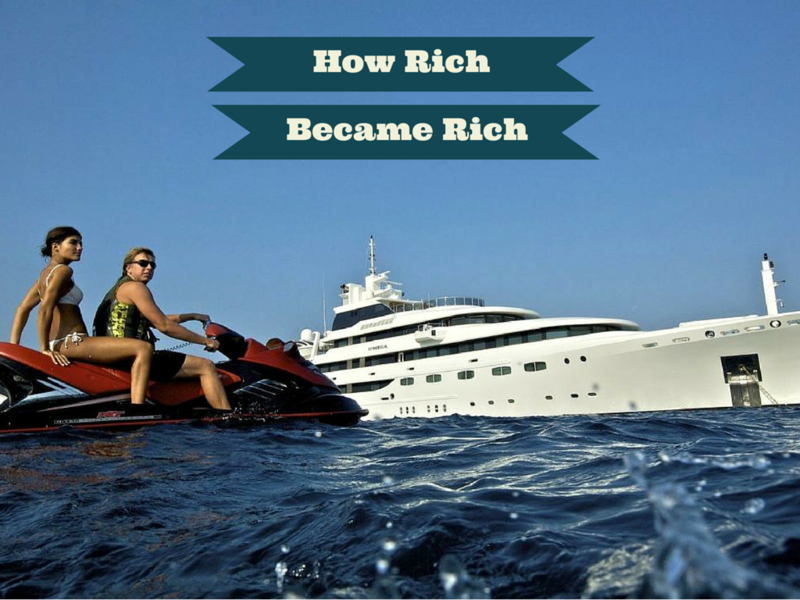 Here are some key facts on the reasons why rich became rich. This post is dedicated to all readers that want to make it monetarily rich one day. I’ll talk about key ingredients which make a person rich. Like everything else, becoming rich requires a lot of hard work and focus. Especially since money is hard to come by, the skills and determination is required for sufficiently longer term. Let’s see how a rich became rich, what right was done. Perhaps this is the biggest factor behind richness. No wonder almost all in Forbes list of rich people are businessmen. They created a business or they inherited one. Though being employed is the ultimate focal point for many, it is different for rich people. Being employed is limiting. You can only make a specific amount of perks for a long time. However, when you open your business venture, every effort is rewarded in additional returns. Rich people took the risk of moving away from employment to venture into self employments which have higher returns. For example, a marketer with a large multinational will only be paid the monthly salary even when he makes the company to double its profits. However, if it’s his business, the double profits would be entirely his. This would make him rich and sustain the level of returns. Examples are numerous, the biggest of ’em – Bill Gates, Mark Zuckerberg, etc. Most rich people started saving very early in their lives to make the right investments. When a person starts saving little by little as early as possible, the account continues to grow with time and become very large. This will help meet the investment focus one has always desired. For example, the rich people put the investment in capital markets and start reaping great profits. By selecting the right bank account, the savings they make even earn some interest. These will supplement income and enable one to reach financial freedom. This is most essential for a common man to become rich. This is not a quick way to richness, rather this will take years and decades to accumulate wealth. But still, this is one of the ways most frequently traveled by others, who for some reason couldn’t start a business. At any time, the amount of money available will never be enough to meet all expenses. To become rich, the rich learnt special budgeting skills that enabled them focus on the more important things that grow their money. For example, the rich always check on money wasters and avoid them as much as possible while making savings or investing in other areas. The rich always focused on understanding why specific companies keep moving ahead in their sales and profitability. They evaluate their financial management and even seek assistance of financial analysts to improve their money management skills. Rich people have designed the best areas to invest. Either personally or using financial investment expert, every opportunity is carefully evaluated. The potential of such ventures is therefore established and its worth drawn. By the time the investment is made, the results are almost certain with the right management. An important fact to pont at is the ability to identify the get rich quick offers and avoid them at all costs. Examples – Warren Buffet and Joerge Soros. A major bottleneck that obscures people from getting rich is liabilities. Inevitable issues such as car accidents and workplace disasters can cause a lot of money in lawsuits. Such lawsuits also form the best grounds for opportunists to reach and benefit from your money. Rich people took insurance covers so that they contribute premiums and insurance companies cover such incidences when they occur. By adopting the right financial management skills, the rich people were able to get higher returns and remain rich. So what are you thinking? Want to follow the riches’ footsteps? These are some of the concept I’m trying to each my children. I want them to understand that the do not have to just work for someone else for the rest of their lives. That if they are intentional with their money they can do anything they like. I had some successful stories that they started from being poor and now they are very rich. They are not afraid to take a risk and they decided to start their own business.